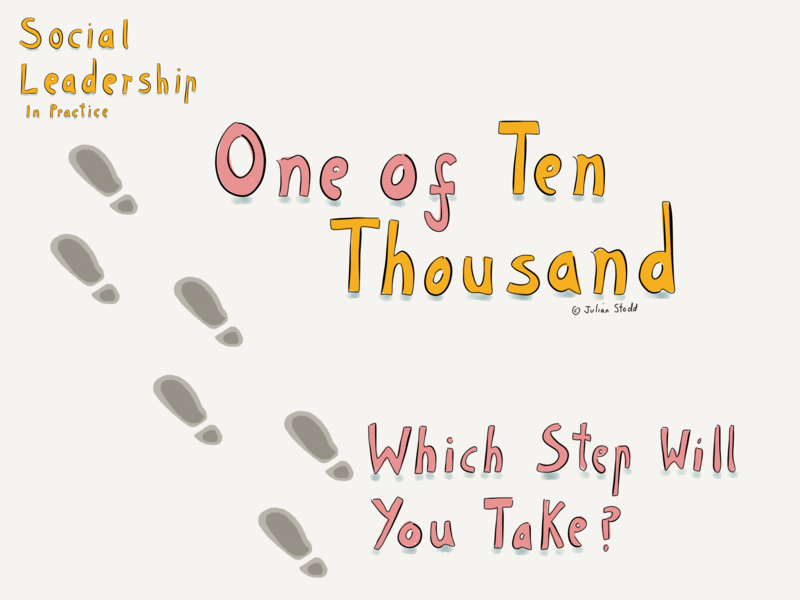 One Of Ten Thousand: Which Step Will You Take? Of whatever magnitude desired, change most often starts with ourselves: whilst we plan for scale and effect, the reality is that the ten thousand steps to change form a daunting pathway. To ask ‘which step will you take’ can form a useful context to large scale Organisational change. It’s easy to consider the things that others need to do, but cultural transformation, of whatever scale, is an aggregated effect, and the step we need to take ourselves can be the last one that we consider. At whatever scale we operate, be it an Executive position, or a graduate trainee, we are constrained by the very mechanisms of effect and enablement that hold the Organisation secure: we are often conditioned into the current state. So whilst it is easy to conceptualise change, it’s hard to actually do it. To realise it. So start with one step. By coincidence, this relates nicely to the broader question of how we make our Organisation more interconnected, how we link up the disparate areas. If the one step you take is to reach out, to have a conversation that you would not otherwise have had, to hear a story that is hard to hear, to do one new thing, then you are, in a small way, with one step, effecting change. Ten thousand steps is an abstraction: maybe it’s a million steps. But the point remains, that change is an aggregated cultural phenomena. Structural change you can measure through headcount and audit, but cultural transformation is only measured through belief and action. And the first step may be the one you take yourself. This entry was posted in Change and tagged Change, Organisations, Transformation. Bookmark the permalink.